What does JIT stand for? What does JIT mean? 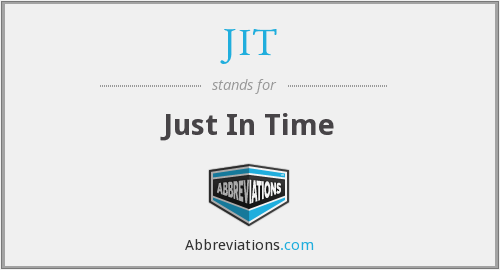 This page is about the various possible meanings of the acronym, abbreviation, shorthand or slang term: JIT. Jit is a style of popular Zimbabwean dance music. It features a swift rhythm played on drums and accompanied by a guitar. Jit evolved out many diverse influences, including domestic chimurenga, Congolese rumba and Tanzanian guitar styles. The genre was popularized in the 1980s by bands like Chazezesa Challengers, The Four Brothers and Bhundu Boys. Jit is the only Zimbabwean fast beat, but there is a confusion between the more popular "sungura" which is said to be jit which was populirised by Chazezesa Challengers and many others including Alick macheso and Ochestra Mberikwazvo. Jit was popularised by Four Brothers fronted by Marshall Munhumumwe, Bhundu Boys fronted by late Biggy Tembo actual name" Mhosva Marasha" the most known name being his stage name.The likes of late James Chimombe,Paul Mpofu played jit. The Zimbabwean musicians who play jit are so many including the author Gibbs Chitate,Mr. Bulk"Chiyangwa,Cephas Mashakada and the Muddy Face,Andy Brown and the Storm some of his songs,Job Mashanda, Charles Charamba and the Fishers of Man although he a Gospel singer his sound borders around jit, Paul Matavire only to mention but just a few.Jit music is originally played by people singing in a circle and playing to or singing with one or two drums called "Mutumba" and these drums are played in rhythm with each other and in sync with the song" vocals".One will be leading with the vocals and the rest will answer to the call, the lead vocalist may chant and the people answering will give the vocalist room to do all the adlibi before they answer. As people sing they may use jingles or "hosho" shakers as African music is generally percussive. It is very unfotunate that "sungura has taken the fast paced tempo class of Zimbabwean music due to it having been promoted by record companies who seek commercialisation of sound as opposed to maintaining the social culture and tradition of a people.Sungura is a basterdised Kenyan rumba and the singing to a certain degree emulates the "kanindo" or East African rumba. Jit type of music is celebratory in its context when used socially either in marriage celebrations, success in games or bumper harvests and many others function of the society.The songs maybe sitirical with a deep hidden meaning and a good selection of words of praise or counseling. Jit can be fused with a lot of different types of instruments such as,saxophone,flute even xylophones "marimba"and some would think it has crossed over to jazz.If one listens to James Chimombe's music one may wonder if he/she is not listening to Jazz music as it borders along that fine line.Jit music in the Northeastern part of Zimbabwe called Murehwa it is known as Jazz or "Pfonda". You will notice why it boarders along with Jazz. Jit can be played in slow beats or fast depending with the occasion. This type of sound is very versatile and exciting.The Zimbabwean master of song Oliver Mutukudzi has some of his songs in jit and Thomas Mapfumo as well. Couldn't find the full form or full meaning of JIT? Know what is JIT? Got another good explanation for JIT? Don't keep it to yourself! "JIT." Abbreviations.com. STANDS4 LLC, 2019. Web. 22 Apr. 2019. <https://www.abbreviations.com/JIT>.